In all seriousness, though Literary Stalker is an ambitious book and one that for the vast majority of its length works exceptionally well. This is a rich and slightly darkly comic novel that has a lot to say about the not so new culture of social media and the instant unearned quest for fame and validation…Keen could have taken the easy route and written this as a straightforward novel with a linear narrative, but Keen isn’t your average writer, and his use of a story within a story multidimensional narrative is more than just a gimmick, it takes reading experience into a whole new level of cleverness. So here is yet another most generous review from a high profile critic or writer. Big thanks is due to Jim for the review and for hosting the interview and book excerpt, making up the package (see posts below). In January I will be contributing an article to Ginger Nuts LGBT+ Month, concerning the challenge of a straight author creating an authentic gay narrator for Literary Stalker, touching on the influence of gay novelists such as William Burroughs and Joel Lane, and looking at the phenomenon of the ‘gay novel’. In conjunction with other Literary Stalker-related material on the Ginger Nuts site, this author interview deals with early influences, my views on horror literature, writing technique, social media and the process of being reviewed by peers. It contains thoughts about the semi-autobiographical and metafictional strands in The Mad Artist and Literary Stalker, and other things, such as the importance of character naming. Could you tell the readers a little bit about yourself? I went to art college in the 1970s and was very involved in the counter-culture scene of that era. I particularly loved the Beat writers, Burroughs and Kerouac, and surrealist painters such as Dali and Magritte. I painted for a while and then took up photography and filmmaking, and after college I worked in TV, including the drama series Robin of Sherwood in the ’80s. I’ve always liked Gothic fiction and movies, and in the ’90s I started writing horror stories and got into the scene, as it was then. More recently I’ve been reviving those associations because Literary Stalker is a return to the horror/crime genre and also it’s ‘about’ the horror-writing world. Watching films and TV and reading, naturally. I try to root out more obscure films and novels I’ve always meant to watch and read – and also classics – and when I finally get around to experiencing them it’s always rewarding. Also I like walking, sometimes in wild country such as the Lake District and the Alps, and occasionally I play golf and ski in winter. I’m a big fan of Indian food and West Country cider, usually in that order. 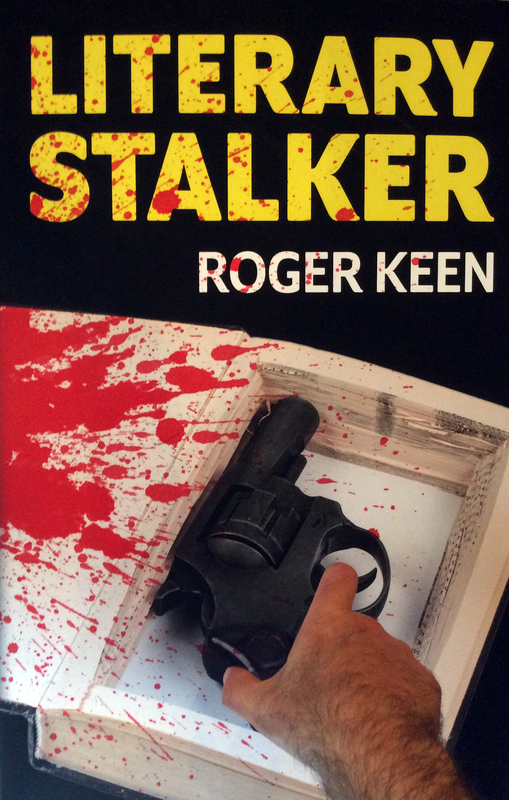 The first of three pieces featuring on the prestigious Ginger Nuts of Horror site, this excerpt is taken from Chapter 11 of Literary Stalker, about half way through, dealing with a tipping point in stalker Nick’s obsession where his intent turns nasty. It is set at a fictional horror convention called ‘Medusacon’ in London in 2006, drawing on many convention experiences. It also features cameo appearances from several real-life horror writers: Neil Gaiman, Joe Hill, Kim Newman and Brian Lumley. Medusacon 2006 was held at a big swish hotel in London’s Docklands, with commanding views of the Thames, Canary Wharf and the pristine Docklands Light Railway providing a cool backdrop to the proceedings. All the ‘usual suspect’ horror, fantasy and sci-fi writers were present, including Stan, Darren, Crimpy, Otto and Darius, together with more illustrious scribes and the Guests of Honour. Film critic and writer Kim Newman attended, in Victorian Gothic mode as usual, with his long flowing hair and full moustache, silk waistcoat and cravat. Horror veteran Brian Lumley enlivened the atmosphere, looking awesome in a white suit and shirt with silver collar tips, and a leather bolo tie and ornate aiguillette around his neck. And horror newcomer Joe Hill floated around enigmatically, with his jet black hair and equally jet black full beard, having recently come out as the son of Stephen King. I liked the look of him, but of course he was married and straight. And besides I was after bigger fish, as the Guests of Honour were Neil Gaiman and the man himself: Hugh Canford-Eversleigh. 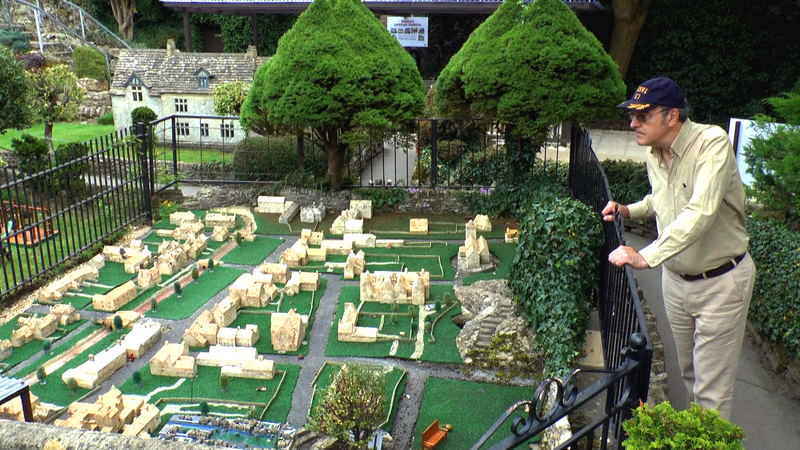 In this fourteen-minute film, I visit the model village at Bourton-on-the-Water in the Cotswolds and use it to talk about the metafictional elements in Literary Stalker and other books and films. This model village is a particularly fine example of the art, completed in 1937 after five years of work. It is most interesting because – as the model stands within the actual village – it has a model of itself, which in turn has a model, and so on, creating an infinite regression. This has been a source of awe to me, ever since I first visited the model at the age of twelve or thirteen in the 1960s. I refer to the model to illustrate the infinite regression of novels-within-novels in Literary Stalker, comparing it to the movie Synecdoche, New York, which does a similar thing. I also look at the Möbius strip narrative devices in Literary Stalker together with my previous book The Mad Artist, again making comparisons to books and films, such Finnegans Wake, Mulholland Drive and Lost Highway – and the rabbit-hole reality bending of The Matrix. The third element of the talk touches on the genre of ‘metacrime’ and Literary Stalker, and I mention other simpatico works by writers including Jorge Luis Borges, Vladimir Nabokov, Paul Auster, Martin Amis, Flann O’Brien, Cameron McCabe, Joe Hill and Dennis Potter. All good things come to an end, and sadly that’s true of the terrific Literary Stalker Blog Tour with Confessions of a Reviewer. Confessions themselves have hosted the final stops, which include a two-part in-depth interview with myself and a review of the novel. Big thanks to Nev Murray and the rest of the team for the excellent hard work in putting the tour together, other social media publicity and the concluding pieces. I would strongly recommend Confessions if you are considering publicity for a horror-related book. The first part of the interview covers early influences, my writing and TV careers and the evolution of ‘mad artistry’. And the second part looks into the ideas behind Literary Stalker, metacrime and metahorror and also the challenge of a straight author creating a gay narrator, drawing on novels such as Queer by William Burroughs and From Blue to Black by Joel Lane. Then there are some more revelations of social media debacles in the ‘Ten Confessions’ section. There are a lot of references to movie plots and murder scenes, as you would imagine when the main character is murdering people just like in his favourite movies. This part I enjoyed because having watched most of the movies mentioned, it was easy to relate to them…It is full of a darker kind of humour and on occasions, a certain Britishness comes through in the story and it certainly lends an extra flavour to it. Watch Nick! He’s a real loose cannon. You never know how he’s going to take umbrage and react. And if you annoy him too much on social media, it might be curtains. His fictional alter ego Jago might even come off the page and enter the real world to get you – like Freddy in Wes Craven’s New Nightmare! Ha! Ha! Ha! Such sentiments as the above are becoming commonplace in reviews of Literary Stalker. Read the latest on the current blog tour from Terror Tree, with big thanks to Yvonne Davies. The majority of us live on social media and it is one of the best ways to spread the word about what you are doing. But what happens when an innocent comment is taken the wrong way or someone does not like your work. 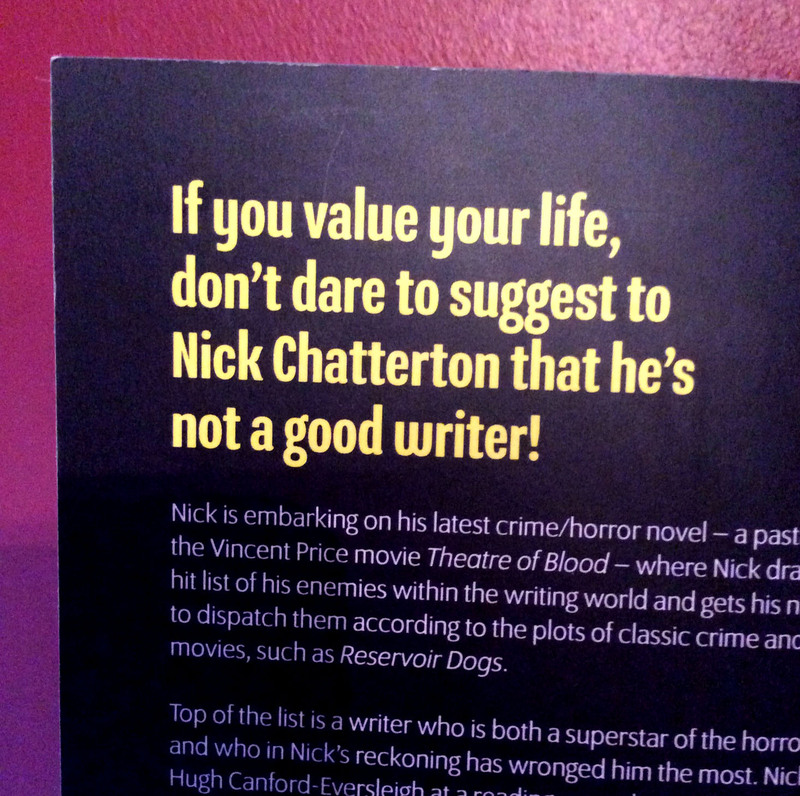 Nick Chatterton, an Indie author uses his personal experience on social media to pen The Facebook Murders. Nick is an aspiring author, working the horror scenes whilst connecting with other authors and a major user of social media. Having published a few short stories, he was looking for that next big novel. An idea came to him when he re-watched Theatre of Blood and the novel was born. Using Jago as Nick’s main character showed how vindictive and petty Nick was. How he fixated on certain Facebook comments and wanted to seek revenge. 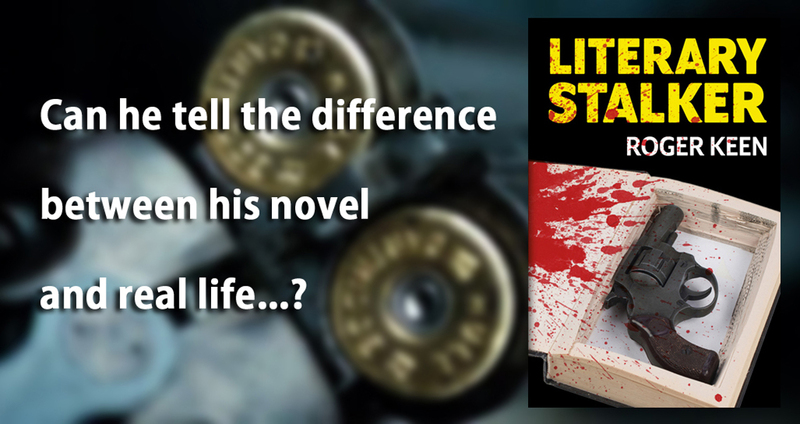 However he had a dark side which showed itself when he was conjuring up the murders, whilst they were based on scenes from films, you could feel his blood lust and knew he enjoyed them too much. Guest post for The Haunted Reading Room, which travels the meta-road from highbrow Borges and Martin Amis to the popular culture of Wes Craven’s Scream series and Joe Hill’s stories, relating it to the writing of Literary Stalker. Thanks to Mallory Heart for hosting. 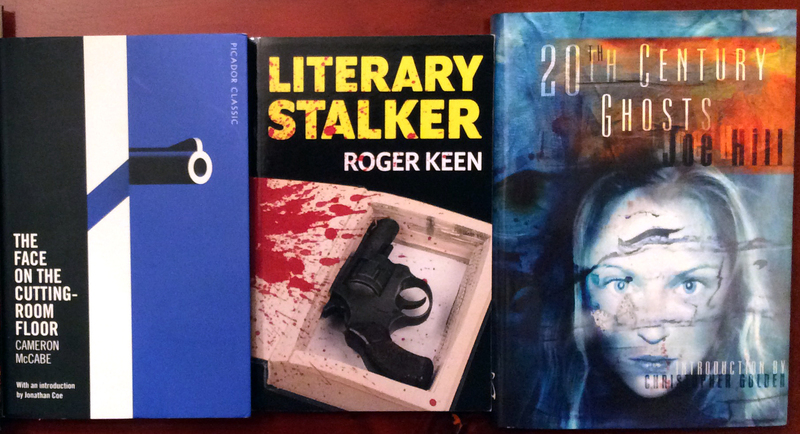 Though Literary Stalker is primarily a psychological crime/horror novel about revenge, another important aspect is the metafictional dimension, the nested novels-within-novels and the self-conscious play with the different levels of the ‘real’ and ‘fictional’. When I mention a word like ‘metafiction’ I can almost hear the groans of some readers, expecting to get a lecture on highbrow postmodernist writing of the kind practised by Borges, Nabokov, John Barth, Doris Lessing and Martin Amis…to name but a few. Or on films by the likes of Fellini and Truffaut. Yes, all that self-referential deconstructionist stuff hardly conjures up a vision of a fluent entertaining read or watch, but still the principles of metafiction have filtered down into the mainstream somewhat, and have also reached works of popular culture.